Melbourne-based painter Gina Kalabishis explores the feeling of love in all its permutations. Utilising the motifs and mythology of Australia’s native flora, and creating compositions inspired by ikebana arrangements, she constructs intimate interior/landscape narratives in which the human experience becomes enmeshed with the beauty of nature. In 2014 Kalabishis was awarded the prestigious Rick Amor Drawing Prize from a field of over 450 submissions, as well as being announced a finalist in the Eutick Still Life Award, and the Adelaide Perry Prize for Drawing. Kalabishis is represented in major collections including the National Gallery of Australia. She lives and works in Melbourne. 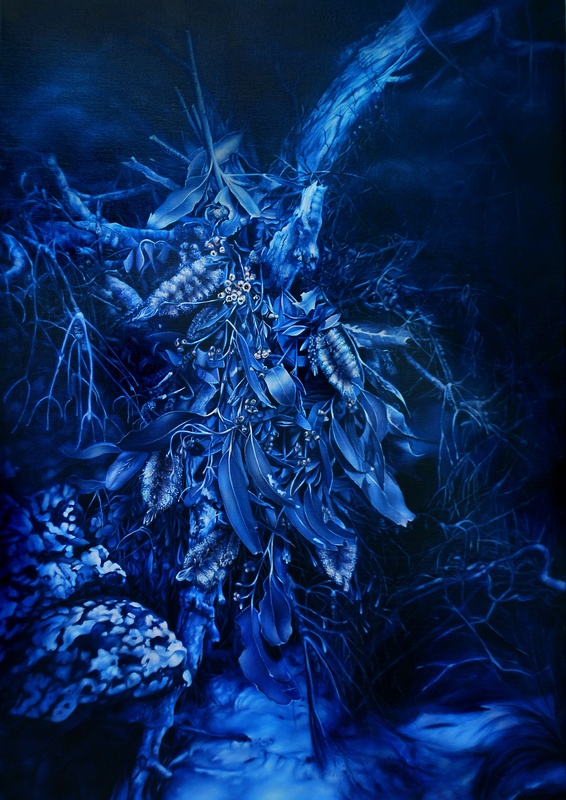 Gina Kalabishis investigates her painterly arēte, activating the Flinders Lane Gallery Showroom in shimmering blue light, themed “Once in a blue moon” Kalabishis will present a number of her blue night paintings melding her playful homage to Australian landscape painting and her sensual ikebana Australian native arrangements as united works. Responding to her paintings Flower Vasette will display a large enamoured native suspended floral arrangement in response to Kalabishis’s work. On the night the artist will be present an informal talk and will be creating a live night drawing responding back to Flower Vasette’s arrangement thus generating a full loop of captivating art making.